For my final in Photography, we had to turn in a portfolio of all our assignments including a final print. The final print qualifications were to shoot a photo of something we hadn't photographed before and to use an alternative angle or crop. 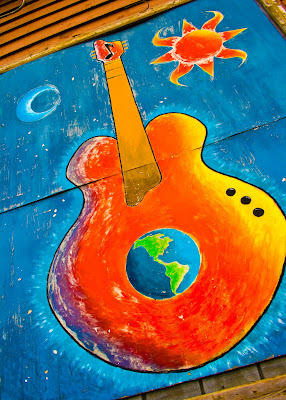 I chose this photo I took of the mural on the wall of the Blues on Grand in Des Moines. Blues is right down the street from us and I walk past it a lot. I've always liked this guitar. So I decided to lay down on the ground and get a picture of it. Hope I get an "A" on this one. Thank you for keeping up with my photography journey this semester - I'm slowly learning more and more about capturing good photos. Stay tuned for next semester: Studio Photography.